List Price: $194.04 Save $32.34! Currently the most popular panel produced by Trina Solar. Versatile and adaptable, with power output ranging up to 260Wp, the TSM-PA05A panel is perfect for large-scale installations, particularly ground-mounted and commercial rooftop systems. 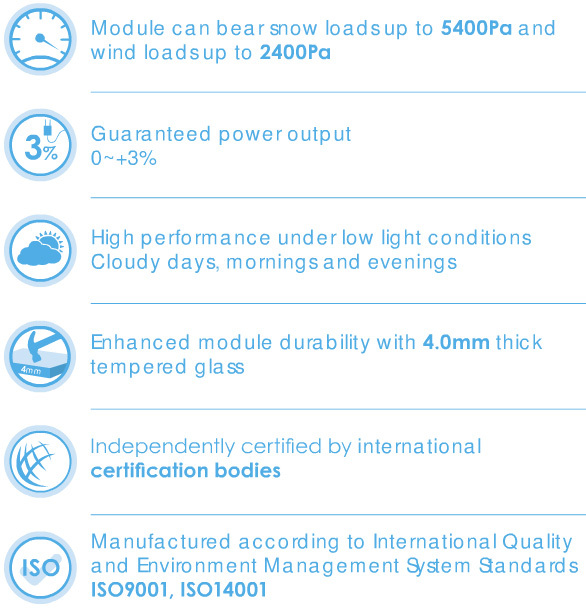 Using reliable and carefully selected components that are tested at the Trina Solar Center of Excellence, this panel comes with a 25-year performance guarantee of 80% power production. Trina is one of the few PV manufacturers that has developed a vertically integrated business model from the production of crystalline ingots, wafers and cells to the assembly of high quality modules. Producing each step of the value chain in-house helps to ensure that we deliver high-quality and cost-effective products to our on-grid and off-grid commercial, industrial, institutional, residential and utility scale customers around the globe.